The Federal Medical Simulation Training Consortium (FMSTC.org) is a partnership of Department of Defense and other federal institutions, such as the Veterans Administration (VA), both of which are involved in medical training and education. 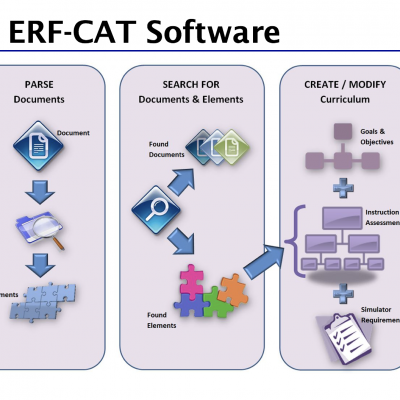 CRESST has developed a toolkit, the ERF-CAT (Educational Resource–Curriculum Assessment Toolkit) which contains templates and methodologies to allow the consortium to survey each institution’s curriculum to develop a framework that will allow current curricula to be categorized, searched, and compared. A template has been developed for each category to guide evaluation and refinement of existing curricula and development of new curricula, along with a set of training effectiveness metrics to allow comparison of curricula within a category. CRESST developed and implemented operational procedures for maintaining and developing curricula within the framework. These procedures, developed with support from subject matter experts that were provided by FMSTC, will include a FMSTC-wide strategy to collect, maintain, and analyze performance metrics, and policies for creating, maintaining, and removing curricula from the framework.